For me, Lewis was someone deeply intuitive of others. Maybe because he knew he was going to die. Are you suffering from a sleep disorder lately so you always get up with giant bags under your eyes? Or are you hyperkinetic due to an overdose of cola during a night of “binge-watching”? No problem. Simply start the movie “Personal Shopper” and these problems have been solved without any doubt. If there would be an Oscar category called “Most boring film of the year“, this film would have won it easily. 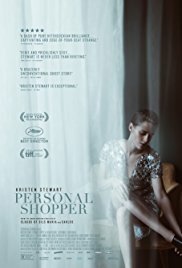 In short: The whole movie you’ll see Maureen (Kristen Stewart) do some shopping for a high-society model named Kyra (Nora von Waldstätten), driving around in Paris on her moped, meditate while smoking lots of cigarettes and sending a whole series of messages on her iPhone. And she’s also waiting for a sign of life (how ambiguous) of her recently deceased brother Lewis. Apart from some ectoplasm and flickering light phenomena, there’s nothing ghostly to see. A sleep-inducing performance. And even the few scenes in which Stewart walks around half-naked and even masturbates, won’t help. Her cup size is of the same caliber as this film. Meager. Maybe I’m a bit biased because I’m immensely annoyed by the person Kristen Stewart. On the other hand. You need a film character who doesn’t feel good about herself and who’s constantly in a melancholic mood, she’s surely the right candidate. If there’s an actress you can admire a whole movie without showing one sincere smile and a face that seems to be dipped in starch, then she’s definitely the one. I still remember this quote: “Kristen Stewart is like my refrigerator, no matter what I put in it (milk, soda, eggs, vegetables, meat), it’s always a refrigerator. And so is she“. I really can’t understand why she’s being praised by everybody. And every time I read about her, superlatives like “authenticity” and “subtle” are being used. Well, you can also say that about the Scarlett Johanssons, Saoirse Ronans, Dakota Fanningsen and even the Jennifer Lawrences in Hollywood. The only difference is that these actresses show some variation in their facial expressions. “Personal Shopper” is once again an arthouse creation. And the artificial world of fashion fits extremely well with it. Both the film and the world of fashion have the same irritating effect on me. They create an artificial product that is reasonably pretentious and targets the group of the happy few. The arthouse film lovers are those happy few who are able to see the abstract meaning and the symbolism behind such an intellectual film. In the fashion world, the happy few are those who can afford an exclusive sewn together piece of confection. And after a certain time, they’ll loudly proclaim that this expensive piece of cloth is out of fashion. By the way. Who can explain to me the usefulness of such a wire-shaped corset that Maureen wears at a certain moment? The connoisseurs will most likely scream bloody murder and call me a retard who doesn’t understand fashion. I hope for myself that it’ll remain like that. Which subject this film tries to tackle, is not so easy to interpret. On the one hand, there’s the spiritual issue and the connection of the living with wandering souls. On the other hand, there is the subject of materialistic thinking and the impersonal world in which we live. The primordial conversation between Maureen and the unknown (the bouncing dots and plopping sounds really started to get on my nerves after a while) is also a reference to the contemporary impersonal conversations among individuals. So how to interpret this movie? I guess you could explain it in many ways. Best you fill in the gaps yourself after watching this movie. Keep in mind that Maureen waits for the unknown person in a hotel room and shortly thereafter you’ll see doors open automatically without seeing anybody. That puts the whole from a completely different perspective. Or not? If not, then I think that the very last bang is a clear statement. But you need endurance to sit out this long ride and witness this slightly intense moment. Ending with Maureen looking straight at the camera. Emotionless. Trust me. Me and Kirsten Stewart. That’ll never work out.